Brush 1 tablespoon of extra virgin olive oil evenly on each chicken cutlet, then sprinkle with sea salt and freshly ground black pepper. Cook the chicken cutlets on the grill or a cast iron skillet over medium-high heat for 5 minutes on each side. The internal temperature on the chicken should read 165℉. Allow the chicken to rest for 5 minutes, then slice into strips. For the salad dressing, combine the extra virgin olive oil, balsamic vinegar, dijon mustard, marjoram, garlic powder, and sea salt and freshly ground black pepper in a salad dressing shaker. Shake vigorously to emulsify. In a large mixing bowl, toss the mixed baby greens with the salad dressing. Divide the baby greens between two salad bowls. 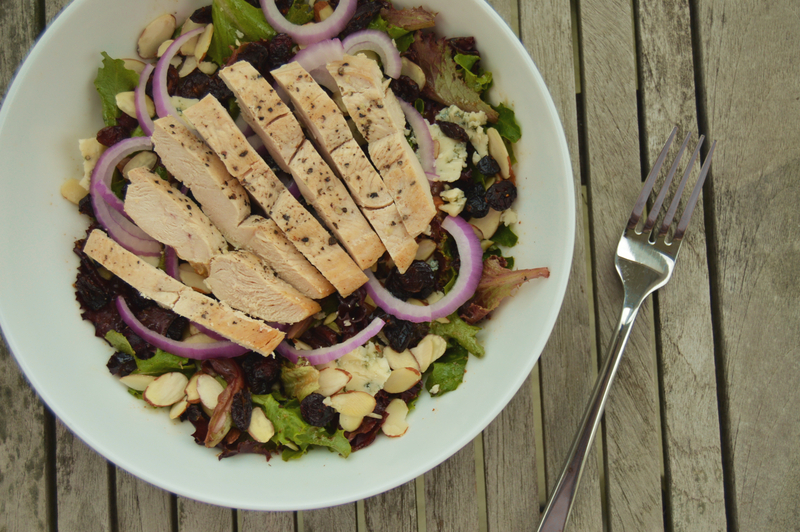 Top with sliced red onion, dried cranberries, bleu cheese crumbles, sliced almonds, and chicken strips. Serve and enjoy!